Definition at line 124 of file audioengine_fmod.h. Definition at line 641 of file audioengine_fmod.cpp. Definition at line 647 of file audioengine_fmod.cpp. 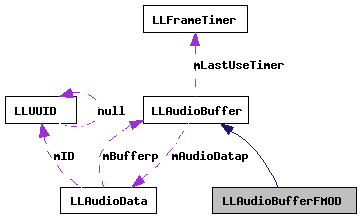 Definition at line 731 of file audioengine_fmod.cpp. Definition at line 136 of file audioengine_fmod.h. Definition at line 658 of file audioengine_fmod.cpp. References FALSE, LLFile::fopen(), ll_apr_file_open(), LL_APR_RPB, llassert, llendl, llwarns, mSamplep, NULL, LLFile::remove(), S32, and TRUE. Definition at line 742 of file audioengine_fmod.cpp. References llendl, llwarns, and mSamplep. Definition at line 132 of file audioengine_fmod.h. Definition at line 138 of file audioengine_fmod.h. Referenced by getLength(), getSample(), LLAudioBufferFMOD(), loadWAV(), set3DMode(), and ~LLAudioBufferFMOD().